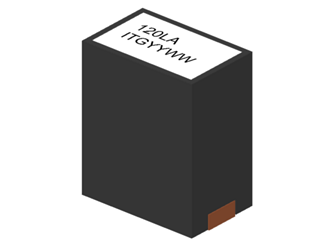 •Ferrite based SMD inductor with lower core loss. •Inductance Range: 70.0nH to 330.0nH, Custom values are welcomed. •High current output chokes, up to 180.0 Amp with approx. 20% roll off. •Low Profile 12.00 mm Max. height . •Foot Print 10.00 x 6.40 mm . •Perfect for high density designs with limited board space. •Operating frequency up to 5.0 MHz application. •Operating Temperature Range -55°C to + 130°C , RoHs & HF compliance .